Training is the process of preparing men and women for their careers in the military. Training is progressive and continues all the way through an individual’s career; being a mixture of mandatory, optional, individual and collective training and educational programmes. The purpose of Phase 1 initial military training is to turn civilian recruits into partly-trained Air personnel and lasts between 11 and 32 weeks, role dependent. The Royal Air Force’s initial military training produces fit, motivated individuals capable of carrying out Air Power tasks in any operational environment. Those who pass are fully prepared to embark on the next phase of their Air Force training. Like any other organisation the RAF relies on the skills and abilities of its personnel. Initial training will focus on preparing the individual, both physically and mentally, to take on the challenges and responsibilities of RAF life. This is followed by Phase 2 Specialist training in the skills needed for an individual to undertake their particular job. The RAF encourages everyone (regardless of rank) to continue their professional development throughout their career. A lot of RAF training earns civilian qualifications so, if an individual chooses to leave, employers will be able to recognise the skills the individual can offer. This article is divided into six sections for easier reading with Section One providing some background information, whilst Section Two looks at the organisation of training in the RAF. Section Three looks at Other Ranks initial training, whilst Section Four looks at commissioned officers. Section Five highlights oversight and instructor training. Finally, Section Six offers an alternative view on the role of Phase 1 initial training, and then provides some useful links and also references. HQ Air Command: RAF High Wycombe, situated at Naphill in Buckinghamshire, is the home of the RAFs HQ Air Command. It was formed on 01 April 2007, when the RAF’s Personnel & Training Command and Strike Command merged. The reason for creating a single Command, with a single fully integrated HQ, was to better equip the RAF to provide a coherent and coordinated single Air focus to the other Services, MOD (Ministry of Defence) Head Office, the PJHQ (Permanent Joint Headquarters) and the rest of MOD. RAF Stations: There are bases (or ‘stations’) across the UK; in England, Wales and Scotland, and one in Northern Ireland. As part of Air Command, every base has its own role, which can cover anything from front-line operations to training establishments. Bases are usually home to a number of squadrons, which are the basic units that make up each RAF station. RAF Squadrons: the squadron is the basic fighting unit of the Royal Air Force. Although the shape and composition will vary depending of their role, squadrons are generally organised in a similar way. Expeditionary Air Force (EAF) Model: facilitated through expeditionary air groups (EAG) and expeditionary air wings (EAW), enables the RAF to offer the very best support to the Land Forces across the entire spectrum of Air Power roles – Attack, Air Mobility, Control of the Air and Intelligence. The RAF is divided into ‘groups’ and then into ‘wings’. These are put together from two or more squadrons – the basic organisational units of the RAF. With regards to training establishments, the RAFs initial military training landscape has undergone a number of changes over the past 20 years. 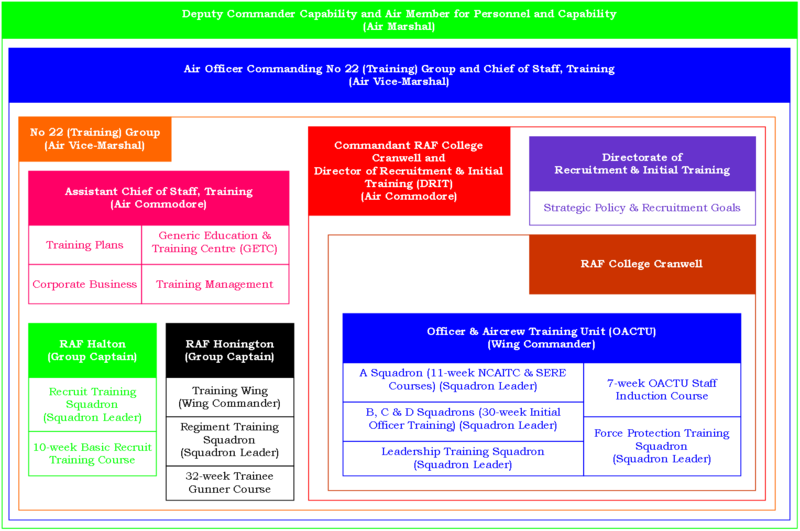 Figure 1, below, presents the ‘current’ (February 2014) RAF initial military training landscape. Figure 2, below, presents the RAFs initial military training by age, entry type and location. 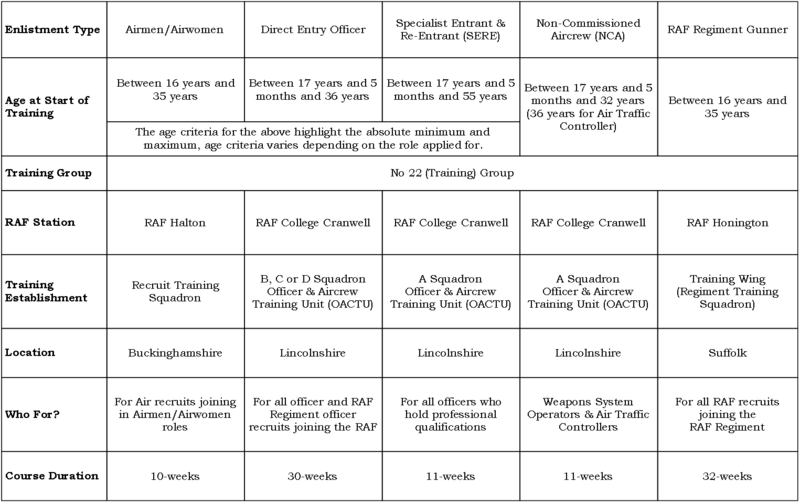 Figure 2: RAF initial military training by age, entry type and location. As Figures 1 and 2 demonstrate, initial training is conducted at a number of training centres – corporately termed Defence Training Establishments – around the country and where an individual conducts their Phase 1 initial training will depend on which job they will be doing. All officers, regardless of role, will complete their initial training at the RAF College Cranwell. The Deputy Commander Capability and Air Member for Personnel and Capability (DCom Cap and AMP&C) is an RAF officer with the rank of Air Marshal. As the DCom Cap the post holder has responsibility for No 22 (Training) Group and personnel management functions. As the AMP&C, the post holder is the senior RAF officer responsible for personnel matters and is a member of the Air Force Board. The AMP&C is in charge of all aspects of recruiting, non-operational flying and ground training, career management, welfare, terms and conditions of service, and resettlement for RAF regular, reserve and civilian staffs worldwide. The Air Officer Commanding (AOC) No 22 (Training) Group, an Air Vice-Marshal, is the head of No 22 (Training) Group which exists to recruit and train RAF personnel and provide trained specialist personnel to the RAF and the other two Services. The role of No 22 (Training) Group, ‘The Group’, is to deliver individual training and education services for the RAF and elements of the Naval Service and British Army, in order to underpin the military effectiveness of Defence. If fulfils this role through recruiting RAF personnel and providing trained specialist personnel to the RAF and the other two Services (such as providing the Army Air Corps with trained Helicopter pilots). With an annual budget of some £435 million (excluding service pay) the Group has a staff of over 7,500 with an annual through put of around 55,000 trainees. The Group operates around 450 training aircraft across 8 major sites in the UK and many smaller centres. In addition, the Head of No 22 (Training) Group – in the role of Chief of Staff, Training – is responsible for ‘through-life’ training for RAF personnel; i.e. Phase 3 career training. Flying training for all types of aircraft (rotary wing, fast jet, multi-engine aircraft). Operating the Royal Air Force Aerobatic Team (RAFAT), better known as The Red Arrows. Generic Education and Training Centre. The co-ordination of No 22 (Training) Group business, including assimilation of briefing material, cross briefings, Investors in People (IiP), and Communications Strategy and Information Management. Strategy and advice to No 22 (Training) Group members and the No 22 (Training) Group Command Board on No 22 (Training) Group Continuous Improvement. The formulation and implementation of the No 22 (Training) Group Business Continuity Plan. The development of No 22 (Training) Group Estate Strategy. Future Strategy for the Air Cadet Organisation. International Defence Training (IDT): training in support of Defence Diplomacy and marketing and selling spare RAF training capacity to UK and overseas customers. Providing a graphics design, multimedia, photography and video service to No 22 (Training) Group and the wider RAF. Providing a modern photocopying and printing service to Air Command at RAF High Wycombe. Command and control of the Training Analysis Centre located at RAF Halton. The responsibilities of Training Management include the implementation of new, or revised, training i.e. training that is not formal trade or branch training. Such training can be individual or collective. DACOS TM has command and control responsibility for the School of Physical Training at Cosford and for the Force Development Training Centres at Grantown-on Spey, Fairbourne, Crickhowell and the Joint Services Adventurous Training Unit at Llanrwst. The Defence Survival Evasion Resistance and Extraction Training Organisation with units based at HMS Sultan, RAF St Mawgan and Chicksands is also under DACOS TM command. Determining and staging Continued Professional Development (CPD) programmes for Administration (Training) officers, Physical Education officers (PEdOs), and Physical Training Instructors (PTIs), as well as overseeing PEd and PTI selection and formal training. The increasingly complex and dynamic environment facing the UK today and in the future necessitates greater investment in education and skills development of RAF personnel. Having studied the requirements in detail, the Generic and Education and Training Centre (GETC) are now responsible for managing the introduction of improvements to generic development. The term generic relates to all the skills, knowledge and attitudes that are common to personnel at each rank, irrespective of their particular specialisation. The GETC was formed on 01 October 2007 through amalgamation of the RAF Leadership Centre, Air Warfare Training Management Team, Force Development (FD) Support Group and the 22 (Training) Group Generic Training staffs. Re-profiling and extending senior officer command staff training course. Finally, the GETC are responsible for the introduction of effective communications training for all personnel. The creation of the Generic Education and Training Requirement (GETR) that identifies the breath, depth and timing of the necessary learning event and indicates the associated methods of delivery. The Director Recruitment & Initial Training (RAF) (D RIT (RAF)), an Air Commodore, is the head of the RAFs Directorate of Recruitment and Initial Training (DRIT). D RIT (RAF) is responsible for ensuring that sufficient men and women of the right quality are recruited and trained to meet the needs of the service. D RIT (RAF) is also the Commandant of RAF College Cranwell. The Headquarters of the Directorate of Recruitment and Training (DRIT), based at RAF Cranwell, translates strategic policy and recruitment goals into targets and procedures which enable it to achieve the desired (quality and quantity) intake. Like the other Services, the RAF has to achieve overall down-scaling whilst still maintaining a wide-ranging and progressive recruitment policy and training excellence. The RAF College Cranwell, in Lincolnshire, selects and trains the RAF’s future leaders and also has responsibility for all RAF recruiting and initial training. All of the activity at the RAF College is supported and directed by a Headquarters situated in the most iconic of RAF buildings, College Hall. The Commandant of RAF College Cranwell, an Air Commodore, is also the Director of Recruitment and Initial Training (DRIT). In addition to deputising for the Commandant across all areas of the post holder’s portfolio, the Deputy Commandant heads the College Headquarters which has both a policy and a supporting function. Firstly, the College Headquarters leads for No 22 (Training) Group on the development of RAF policy for recruiting, selection and initial training, and coordinates pan-Directorate delivery where necessary. Provision of library services in both College Hall and Trenchard Hall. The Officer and Aircrew Training Unit (OACTU) have responsibility for all officer and Non-Commissioned Aircrew (NCA) training delivered at RAF College Cranwell. The Specialist Entrant and Re-Entrant (SERE) course. B, C and D Squadrons are the main Initial Officer Training Squadrons. The character, spirit and ethos of the RAF are underpinned through historical examples and contemporary role modelling at every stage of training at OACTU and a great emphasis is placed in the cultivation of interest in the Service amongst the cadet body. To create the ‘war fighter first’ mindset, the importance of the traditions, esprit de corps and heritage of the RAF is heavily played. Consequently, the sense of belonging is cultivated in the cadets at the earliest stage of their RAF careers and provides a platform upon which a pride and real belief in their Service can be developed. The values, beliefs and code of conduct demanded by the Service are developed and nurtured throughout training in order to create a sustained interest and pride in the history of the RAF for the Cadets to take with them into their professional training and beyond. There are a number of Squadrons that form part of the Officer and Aircrew Training Unit; each having a distinct remit and their own traditions. Force Protection Training Squadron comprises the Regiment Training Flight and the Training Support Flight consisting of RAF Regiment, Personnel Support and Mechanical Transport trade group personnel. Regiment Training Flight is responsible for providing initial military skills training for all Initial Officer Training and Specialist Entrant and Re-entrant Officer Cadets. This training includes instruction in First Aid, Weapon Training, Chemical, Biological, Radiological and Nuclear (CBRN) Defence, Skill at Arms, Recuperation and Live Firing. Instructors are also responsible for teaching Land Navigation and more advanced Force Protection Skills in order to enable Force Protection exercise scenarios to be used as a vehicle to instruct, practice and test leadership skills. Training Support Flight is responsible for the organisation, planning, support and practical implementation of all Leadership exercises. As the RAF Regiment are ‘Guardians of the Military Soul’ of the RAF, Force Protection Training Squadron is responsible for OACTU’s military standards in addition to all ceremonial training and commitments. RAFC Cranwell is tasked with providing the very best Officers and NCA for the future of the RAF; as such, a key element is to teach the highest standards of leadership. OACTU achieves this through the use of the Leadership Training Squadron (LTS). LTS was formed following a 2004 review of the training conducted at Cranwell. It was felt that as leadership was such a key element of any Officer or NCA training, there needed to be a dedicated squadron; the purpose of which is to promote leadership excellence throughout the RAFC Cranwell training. LTS is responsible for the leadership syllabus delivered at RAFC Cranwell and the field leadership exercises that are used to develop the trainees’ practical implementation of the theory and skills taught in the classroom. LTS works across the whole of OACTU, in partnership with all the other training squadrons, to ensure the highest quality of coaching and mentoring in the field of leadership. The RAF Regiment’s Training Wing, part of RAF Honington in Suffolk, provides appropriate recruit, professional and career training for the airmen, NCOs and officers to satisfy the trained manpower requirements of the RAF Regiment. RAF Honington is almost unique in that it delivers initial (Phase 1), specialist (Phase 2) and career (Phase 3) training at one location. Headquarters Squadron, consisting of: Admin Flight (RAO); 4001 Flight (Demo Troops & General Duties); MT Flight; Training Support Cell (Welfare, IT and Classrooms/Training Stores); Training Validation Cell and Course Maintenance Cell (CDC); RAF Regiment Recruit Selection Flight; and the RAF Regiment Recruiting Team. Further Training 3 (FT3), similar to Platoon Sergeant’s Battle Course (PSBC). Regiment Training Squadron (Basics) (RTS(B)), consisting of: Phase 1 and 2 of RAF Regiment Gunner training. This is similar to training delivered at ITC Catterick, however, there are also lessons on ‘Air Awareness’ and Force Protection to prepare individuals for their future roles as RAF Regiment Gunners. Weapon Instructor (WI) Course, run by RTSC for FT2 students. Range Management Qualification (RMQ), the course is 4-weeks long and consists of the standard 2 week RMQ course, which is the same as the one conducted at TAG (UK)/TAG (G). The third week is Shoot to Kill (SA (E) & (F) (90) qualifications) and the fourth week is Battle Lessons and Exercises to gain the SA (M) (07) qualification. The course is attended by JROC and FT2 as their final phase, however recently a small quantity of ‘blue’ RAF has attended the first two weeks; mainly armourers (test firings) and RAF Rifle Association members. Sniper Training, both Sniper Courses are conducted at RTS(C) as centralised training (Basic and Command). Pre-Parachute Selection, P Company equivalent. HMG & GMG T3 courses. Javelin Gunner, at the moment (2012) the Basic Javelin Gunner course is conducted. Future aspirations will be to run Javelin WI Courses at the Training Wing. The Training Analysis Centre (TAC), based at RAF Halton, is the lead RAF organisation for training analysis and contributes to the operational effectiveness of the RAF through the robust analysis of jobs and tasks to underpin current and future training requirements for ground trades and branches. Through this detailed analysis the TAC produces descriptions of the necessary skills and abilities for personnel to be able to undertake their duties. These requirements are identified in either an Operational Performance Statement (OPS) or Competency Framework (CF). From these requirements, appropriate training can then be designed. The TAC also assists sponsors in writing tender specifications and assessing tenders for the training elements of proposed contracts with non-MoD suppliers. When resources permit, the TAC is also involved in the evaluation of training (ensuring that training objectives continue to accurately, and most cost-effectively, reflect the needs of the workforce). The TAC is responsible for the production of OPS’ and CFs’ for airman and officers in the ground trades and branches excluding the medical, musician and fire-fighter specialisations. Individuals joining the RAF will usually be asked to join for between six and twelve years, officers may be able to join for longer. Many extend their career in the RAF well beyond the number of years they join for initially. However, if an individual finds that the RAF really is not for them, it is possible to make arrangements to leave early. In the first six months of service, airmen/airwomen have the right to give 14 days’ notice to leave, subject to completing 28 days’ service. They can also leave, without penalty, three years after completing their initial training. In addition, those aged under 18 years and 3 months will normally be allowed to leave, provided they have registered their unhappiness with Service life with their superiors before their 18th birthday. With the exception of RAF Regiment Gunners (discussed later), initial training for all airmen/airwomen takes place at RAF Halton in Buckinghamshire and lasts for 10-weeks. RAF Halton is a station of No 22 (Training) Group and part of the Directorate of Recruitment and Initial Training. The Basic Recruit Training Course (BRTC) was originally 9-weeks but was extended in April 2013 to include a full week of Force Development (FD) training at an RAF outdoor pursuits centre in Wales (Reilly, 2013). During initial training trainees will learn about military life and how to handle a weapon, master survival techniques and take part in a simulated military exercise. Individuals will also learn what the RAF is about, where they fit in and what to expect on their first posting. The BRTC is designed to build an individual’s military skills and fitness progressively, and training is undertaken within the Recruit Training Squadron (RTS) (Table 1). After being issued with their military kit, trainees will begin a 3-week introduction to military life. Fitness will become part of the daily routine and there will be regular inspections of dress and living quarters. Trainees will undertake marching and drill lessons and learn about the RAFs core values and code of conduct and the history of the RAF. Trainees will also receive guidance on financial awareness, fire prevention, security measures and a healthy lifestyle. Trainees visit one of the RAF FD Training Centres in Wales for a 5-day course which will see trainees participating in Adventurous Training Activities and will provide them with an opportunity to apply their new skills in a different environment. These activities will be used to continue personal development training and will culminate in an arduous 2-day Mountain Walking expedition including map reading, where trainees will be expected to lead their colleagues, work as team, and display the drive and determination to succeed. The RAF will teach trainees the skills necessary to survive and fight in a military environment. As well as firing their first weapon, trainees will learn about camouflage and concealment skills, first aid and also undertake chemical, biological, radiological and nuclear training CBRN) training. Trainees will be taken out into the field for 4-days where their new skills will be tested. Exercise Blue Warrior simulates real battle conditions using controlled explosions and small-arms fire (using blanks). It is as close to the real thing as trainees can get! The final phase of training will prepare trainees for life after Halton. This phase covers what might be expected of trainees on their first posting and how their role fits into the wider RAF team. In preparation for graduation, trainees will also start to incorporate weapons handling into their drill lessons. After ten weeks of training, trainees will be ready for their graduation parade. It will be one of the proudest moments in a trainees career, as well as a great day out for family and friends. As Non-Commissioned Aircrew (NCA) trainees will face plenty of challenges, from serving on operations to developing their leadership skills. Whichever specialisation a trainee chooses, they will be working onboard the RAFs aircraft around the world, potentially with some of the most advanced electronic equipment in the RAF. NCA start with 10 weeks of initial training at RAF Halton in Buckinghamshire, followed by 11 weeks of leadership training at the RAF College Cranwell in Lincolnshire (Table 2). Trainees will spend their first week adjusting to their new surroundings. Fitness will continue to be part of the daily routine and there will still be regular inspections of dress and living quarters. Learning how to gain the trust of people you will lead takes practice, so trainees take part in several team-building and leadership exercises – in the classroom at first and later in the field. In addition, trainees will start to learn about the essential elements of navigation. The focus moves back to the classroom, where the RAF will test maths ability as well as oral and written communications skills. There will also be detailed lectures about air power and the qualities and responsibilities of an SNCO (Senior Non-Commissioned Officer). Trainees spend several days in a military training area, completing a series of time-sensitive exercises in full military gear. Using their leadership skills, trainees will guide a team through a variety of challenges. The RAF creates a high-pressure operational environment that is as close to the real thing as possible. Prior to graduation trainees will sit exams in Maths, Defence Writing and Essential Service Knowledge. Ace these and trainees will earn their place on 55 (R) Squadron, where flying training begins. As an RAF Regiment Gunner, individuals have to be prepared for Arctic, jungle, desert, mountain or urban conditions. Initial training will cover weapons expertise, field craft and combat tactics; with plenty of time for adventurous training activities and sport. The 32-week Trainee Gunner (TG) course prepares trainees for service in RAFs version of infantry. Training is delivered by one of four training teams (flights) and takes place at RAF Honington, in Suffolk, and is the home of the RAF Regiment. Trainees will be taught how to handle and fire weapons in a professional manner and learn how to survive to fight in all environmental conditions (Table 3). The TG course includes navigation, infantry tactics, field craft and lots of physical training. During 2013 the Recruit Training Squadron (Basics) (RTS(B)) developed and delivered a new TG course. The new course is evolving to encompass a wider spectrum of Force Protection, adapted for contingency operations and tailored towards the future character of conflict. As a result of the new programme, trainees are not only learning about the fundamentals of Dismounted Close Combat (DCC) within the wider context of Air FP, but are gaining a wider appreciation of the future battle space that they might find themselves operating within. The new course will frame traditional DCC deeply within Air Operations and see the TGs deploy on two newly developed confirmatory exercises. Exercise (Ex) FIELDCRAFT 3, now renamed Ex ALPHA, focuses on surveillance and target acquisition, defence of forward deployed air operations and the asymmetric Chemical, Biological, Radiological and Nuclear (CBRN) threat. The final exercise is the evolution of Ex OMEGA, which confirms the trainees understanding of Air FP by exposing them to a myriad of on base and off base tasks. It assesses the full spectrum of FP operations from base security, post attack recovery and counter intruder tactics to off base counter-threat kinetic action. Further additions to Phase 3 of the TG course see the trainees’ conduct additional Close Quarter Battle (CQB) training at the Urban Combat Facility (UCF). This training develops their understanding of the nuances of fighting around airfields and the complex terrain they present. The training is hard in order to give trainees the confidence to overcome any situation that they may encounter whilst on operations. Trainees will also complete an apprenticeship, including an NVQ Level 2 in Policing and Security Services as well as Key Skills. Once trainees have completed their initial training, which can include learning to drive, their will receive their first posting. Trainees will learn how to handle the SA80 rifle and use the x4 magnification tritium sight. Trainees will also undertake bayonet training, learn how to throw a grenade and use night vision equipment to work at night. Training will start on the firing ranges and end with a series of field exercises. Trainees will be taken out into the countryside and taught the skills necessary to survive and fight in a field environment. Themes covered include camouflage and concealment skills, map reading and navigation, battlefield first aid and setting up camp safely. RAF Regiment Gunners take pride in their appearance and sense of discipline. Those who excel at drill may one day be chosen to join the prestigious Queen’s Colour Squadron, which performs drill movements to crowds all over the world. Initially the RAF will teach trainees how to iron their kit and buff their shoes to a high shine. Fitness will be part of the daily routine, so there is lots of physical training throughout the course. In addition to gym work, swimming and running, trainees will have the opportunity to spend a week at one of the RAFs adventure training centres. As well as learning about the heritage and history of the RAF Regiment, trainees will about information technology, communications, maths and evidence-gathering skills. There is also a visit to the RAF Museum at Hendon in North London. After 32-weeks of training trainees will be ready for their graduation parade. It is one of the proudest moments in a Gunner’s career as well as a great day out for family and friends. Initial Officer Training (IOT) will introduce the individual to military life and skills. It will also develop leadership skills and show individuals how to gain trust and command respect – crucial aspects of the role of an RAF officer. Officer training is even recognised by civilian institutions and every cadet who makes the grade will earn themselves a Level 5 Diploma from the Institute of Leadership and Management. IOT is made up of three terms, each lasting 10 weeks (Table 4). At the end of each term a trainee’s performance is be reviewed and feedback is given, as well as advice for the next stage. Pass rates based on FOI data (courses 32-39, covering just under 3-year’s duration). Trainees will master the basic military skills required by all RAF personnel. Fitness will become part of the daily routine and there will be regular inspections of dress and living quarters. In addition, trainees will learn about how the RAF carries out its national defence role and works with other organisations all over the world. As well as learning about different techniques, trainees will take part in leadership exercises – in the classroom at first and later in the field. Trainees will fire their weapon for the first time and will have the opportunity to spend a week at one of the RAFs adventurous training centres. Learning how to gain the trust of people you will lead takes practice, so the first week of Term Two will be spent consolidating the leadership skills trainees learnt during Term One. Trainees will spend up to 7 days in a military training area completing a series of time-sensitive exercises in full military gear. Using their new skills trainees will guide their team through a variety of challenges. As well as learning about the RAF’s ethos, culture and history, trainees will learn more about how the RAF expects its officers to present themselves and communicate with others. Finally, trainees will receive lectures from university academics about the concept and strategies behind Air Power, which will be tested on later. A simulated military operation will give trainees the opportunity to demonstrate all the skills they have learnt so far. The RAF will create a high-pressure operational environment that is as close to the real thing as possible. By the end of it trainees will be ready to form an essential part of a powerful military team. If the trainee excels during the simulated exercises, they will be congratulated by their Flight Commander and recommended to progress to the final term. If a trainee finds the exercises too demanding, they will be re-coursed for further training and have another chance to prove themselves. Trainees start Term Three with a week of academic study; learning about what might be expected of them on their first posting. Trainees will then have 4 weeks of training exercises that will put their leadership skills to the test in various operational settings. One of these will take place at the RAFs adventurous training centre in Scotland. Trainees will face a second simulated exercise that is based around a combat operations centre, enabling trainees to gain more experience of life in an operational environment. By now, much of what trainee does will come naturally, so it is a great chance to refine leadership skills. After 30 weeks of training trainees will be ready for their graduation parade. It is one of the proudest moments in any officer’s career, as well as a great day out for family and friends. Trainees will finally receive their official commission as an officer in the RAF. RAF Regiment Officers are responsible for leading, training and administering the Gunners under their command. They are also involved in all aspects of Force Protection planning and may perform other duties as part of the RAF Operations Support Branch. Officers in the Corps spend much of their time planning and training for crisis situations and must therefore be capable of thinking analytically and making difficult decisions under pressure. RAF Regiment Officers lead their Gunners from the front, so must be physically fit and possess an aggressive determination to succeed. Training for RAF Regiment officers starts with IOT at the RAF College Cranwell. After IOT potential RAF Regiment Officers must complete the 35 week Junior Regiment Officers’ Course at RAF Honington, where trainees learn the field skills and tactical knowledge they need to command a flight of Gunners in a combat situation. All professionally qualified (PQ) officers, known as Specialist Branch officers (i.e. legal officers, medical officers & chaplains), begin their RAF career on the Specialist Entrant and Re-Entrant (SERE) course at the RAF College Cranwell in Lincolnshire. The 11-week SERE course is designed for professionally qualified entrants to the RAF, to develop their leadership and management skills. The course includes fitness development, military training and academic study as well as practical outdoor leadership challenges. After the SERE course, PQs will complete a Basic Air Warfare Course at RAF College Cranwell before moving to the Defence Medical Services Training Group for a 2-week course where they will learn about the delivery of medical care in the RAF. This is followed by a further course at the Centre of Aviation Medicine at RAF Henlow in Bedfordshire. Here PQs will learn about the effects of illness and medication on the personnel who work onboard aircraft, aircrew life support and human factors in aviation. The course also includes elements of occupational medicine. Pass rates based on FOI data (courses 26-33, covering 2-year’s duration). The Commissioned Warrant Officers Course (CWOC), known as Late Entry (LE) officers in the British Army, is for those warrant officers selected to be commissioned officers in the RAF. Warrant officers and master air crew commissioned under the commissioned warrant officers scheme do not attend full officer training and are appointed in the rank of flight lieutenant with no additional seniority. All other serving personnel are appointed in the rank of flying officer with additional seniority determined by the substantive rank held, including normal paid acting rank, on commissioning. The CWOC lasts one week and is delivered by A Squadron of OACTU. The CWOC provides an appreciation of the differences between being top of the NCO tree and being a junior officer. The Internal Commissioning Scheme (ICS) is for serving personnel in the rank of senior aircraftsman/woman and above. Leading aircraftsmen/women and below who wish to be considered for commissioning must meet the appropriate eligibility criteria for direct entrants including the required qualifications (for example, NCA must have completed a three-year tour of duty at the time of entry into IOT). An Annual Formal Inspection (AFI) is carried out by the AOC No 22 (Training) Group and encompasses a range of activities, briefings and meetings on RAF stations which are encapsulated within the training remit of the AOC. The OACTU Staff Induction Course (OSIC) is a 7-week pre-employment training programme to prepare instructors for positions at the RAF College by giving them the knowledge and skills that they will require to start doing their jobs here. International military instructors often take the course too prior to working in their home nation training establishments. The OSIC programme provides an overview of OACTU’s training ethos, organisation and administration, a thorough grounding in the theory and practice of leadership instruction and an opportunity to develop personal leadership and team skills. The timetable dovetails with the cadet programme, which allows course members to shadow various exercises and practice and develop their coaching and mentoring skills whilst gaining a comprehensive understanding of teaching through facilitation and the use of the experiential learning cycle. 1 minute max effort of sit-ups. Following successful completion of the OSIC, Instructors are accredited with the Chartered Management Institute (CMI) Level 5 in Coaching and Mentoring, and CMI Level 5 in Leadership and Management. Reilly, J. (2013) First Recruits Graduate From Longer Basic Training Course. Available from World Wide Web: http://www.raf.mod.uk/news/archive/first-recruits-graduate-from-longer-basic-training-course-24062013. [Accessed: 21 February, 2014]. This website is not affiliated with the RAF. You will need to contact RAF Halton to ask their permission to use their assault course.